Cilento, sea and culture. What to visit in S.Maria di Castellabate. 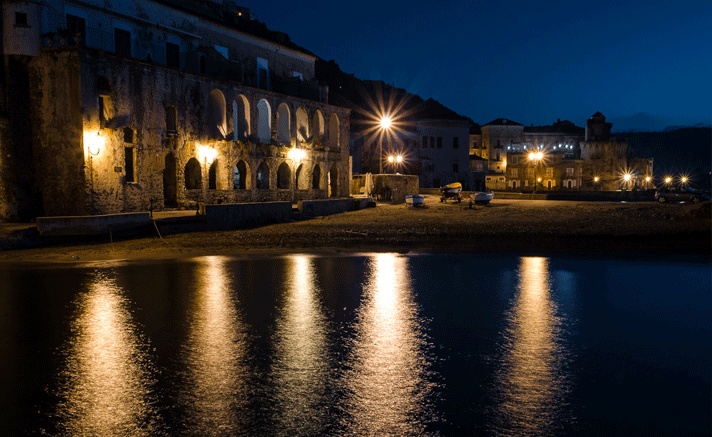 Cilento is not only a sunny place with a clear sea, but also a place of culture and architectural beauties to visit. If after a long day at the beach you want to visit the city attractions, that’s where you can go and what places you can visit for a fascinating walk. Castello dell’Abbate: founded in 1123, this castle is the building around which Castellabate is developed. Surrounded by defensive walls, it hides inside houses, cisterns and underground tunnels that, according to some legends, lead from the top to the marine surroundings. Breathtaking is the view that you can enjoy from the viewpoint of the Castle, which gives on the whole village with its stone streets, and on the sea. Often it is the scene of cultural events and art exhibitions. Santuario di Santa Maria a Mare: built almost on the beach, Santa Maria a Mare Church was built in 1102 in Santa Maria di Castellabate and it has undergone several interventions during the years. It consists of three naves and a hexagonal base bell tower and it houses the statue of Santa Maria a Mare at the center of the apse. She is the protector of the hamlet of Castellabate, and her statue is carried in procession by fishermen on the shoulder on the day of its celebration. Villa Matarazzo: located in the middle of the street named “Corso Matarazzo” in Santa Maria di Castellabate, the nineteenth century villa was the summer residence of the noble family Matarazzo. It includes gardens and fields that once housed the former vineyard and it became the property of the Cilento Park. During the year, it is the scene of many cultural events, such as Leucosia prize, and theatrical and musical performances. Porticciolo delle Gatte: Santa Maria di Castellabate was the hamlet devoted to the trades that took place in Travierso port, commonly known as “Porto delle Gatte”. The particular name seems to be due to the fact that enlightened portico at night, looks like cat eyes from the sea. The colonnade, which once hid the pantry warehouses for merchandise, has changed several times its use. Now it accommodates restaurants and bars and, in summer, it is still used as a harbor for small boats.